The single-place F-104G and two-place TF-104G airplanes are high-performance, all-weather, day and night fighter-bomber-interceptors powered by an axial-flow, turbojet engine with afterburner. The airplane, built by the Lockheed Aircraft Corporation, is designed for high subsonic cruise and high supersonic combat speeds. The two-place TF-104G is used primarily as a pilot trainer. Notable features of the airplane include extremely thin flight surfaces, short straight wings with negative dihedral, irreversible-hydraulically-powered flight controls, controllable horizontal stabilizer, engine inlet duct anti-icing, an antiskid brake system, an automatic pitch control system, and on single-place aircraft a maneuvering automatic pilot. The wings have leading edge and trailing edge flaps, and a boundary layer control system which is used in conjunction with the trailing edge flaps to reduce landing speeds. An upward ejection system is used for emergency escape. A drag chute is installed to reduce the landing roll and an arresting hook is available for bringing the aircraft to an emergency stop. Internal fuel cells and external fuel tanks may be serviced through a single-point pressure refueling system. The photoreconnaissance version of the F-104G has three cameras installed in area of the shell case stowage compartment and is referred to as the RF-104G. The F-104G was an improved version of the -C model built in the US under the Military Assistance Program (MAP) and internationally by Consortium. The USAF never bought any -G models; however, the aircraft was operated by the USAF for training of non-USAF pilots primarily from Germany. The last active user of the Starfighter is Italy with the updated and improved F-104S. 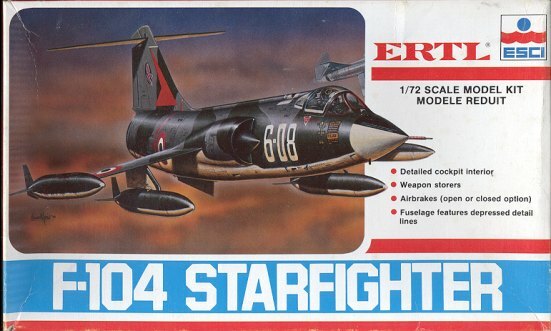 Before the Hasegawa F-104 wunderkits came around in the late 1980s, this was the best kit on the market. Crisply engraved panel lines and decent cockpit and wheel well detail made this one a real joy to build. What's more, thanks to its lack of fiddly bits that are so rampant with newer high quality kits, it can be built is a reasonable amount of time. The kit comes with fuselage mounted Sidewinders, the centerline having a fuel tank and the wings and wing tips sporting thin fuel tanks. The wing tip fuel tanks are stressed for the full range of Starfighter operations and rarely leave the plane. Another option is to have the speed brakes open or closed. 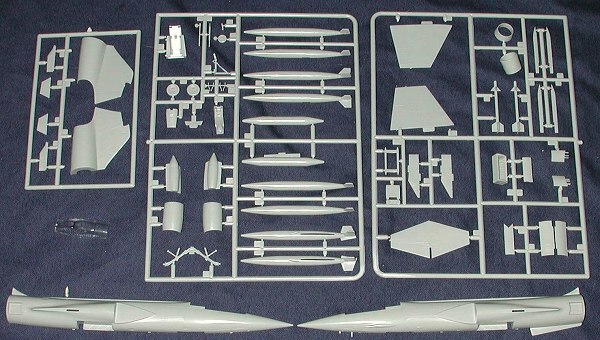 The tail section is separate as even ESCI wanted to get maximum use of the mold by offering the smaller tailed F-104C kit. As with most ESCI kits, the canopy is a single piece so will have to be cut to display it open. However, it is thin and very clear. The kit does not come with the slightly wider wheels and bulged main gear doors as were fitted to late F-104Gs. Instructions are very well done with colors given in generic terms as well as Humbrol numbers (though these are an earler Humbrol color set and the numbers may not match what is currently available). FS 595 reference numbers are given where appropriate. 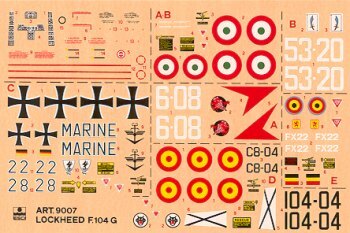 Markings are, as with most ESCI kits, provided for a number of different aircraft. First is the box art aircraft from the 6th Stormo 154 Gruppo of the AMI in the old markings with white code letters and large roundels. An optional set is provided for the 53rd Stormo, 21st Gruppo. Next is a German Navy MFG 1 plane in the old grey over white scheme. From Spain is a bare metal 104G from the appropriately named Escuadron 104. Finally a Belgian Starfighter from the 10th FBW in standard USAF SEA camouflage. For those of you not satisfied with these markings, there are a number of alternative aftermarket sheets for this plane. Kit decals are quite matte and well printed. Having built a number of these and those in AMT boxes, I can tell you that they build into very nice models and in a relatively quick amount of time. This is a kit that is perfect for those who are just getting into 'serious' model building. Review kit courtesy of me.